King David made Jerusalem his capital more than 3,000 years ago, and Jewish people have lived in this city for over 3,000 years. It was also well known as "The City of David." 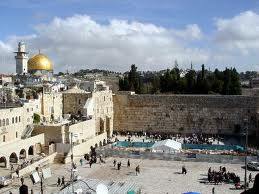 Jews have constituted the largest single group of people living in Jerusalem since the 1840's. In 1844 there were 7,120 Jews, 5,000 Muslims and 3,390 Christians. This city has played a central role in Jewish existence. The Western Wall in the Old City is the last remaining wall of the ancient Jewish Temple and has been the object of Jewish veneration and a focal point for Jewish prayer. Three times a day since 70 CE Jews have prayed "To Jerusalem, thy city, shall we return with joy." Israel became reborn on May 14, 1948, but Jews couldn't enter east Jerusalem. Jews have united the whole city through the terrible war when they were attacked by neighboring Arab countries in 1967. Muslims have their own special places which are outside of Israel. Their cities of reverence are Mecca or Medina in Saudi Arabia. Jerusalem has no major Islamic importance. They are only interested in the majestic Dome of the Rock that is in Jerusalem. Jerusalem has never served as a provincial capital under Muslim rule. Nor was it ever a Muslim cultural center. If anyone has the audacity to say that Jerusalem need not be the capital of Israel and are Americans, then they should consider someday losing Washington DC. How would they feel to return to the land and consider having to take another city as their capital when they have always had Americans residing in Washington DC. Does that make sense? The USA's history started only almost 400 years ago with the 1620 ship, Mayflower landing. Israel's history goes back to the 2nd millennium BCE which would be about 4,000 years ago. Let's look at Jerusalem's population history with Jews and Muslims living there. Muslims lived in the East section, and Jews lived in the rest of Jerusalem. It is no longer a divided city but united. The former mayor of Jerusalem, Teddy Kollek had said that, "Throughout centuries of exile, Jerusalem remained alive in the hearts of Jews everywhere as Jerusalem was the focal point of Jewish history. It is the symbol of ancient glory, spiritual fulfillment and modern renewal. This heart and soul of the Jewish people engenders the thought that if you want one simple word to symbolize all of Jewish history, that word would be, Jerusalem." Leon Uris and his wife, Jill, wrote in Jerusalem. "Jerusalem "has known only 2 periods of true greatness, and these have been separated by 2,000 years. Greatness has only happened under Jewish rule. This is so because the Jews have loved her the most, and have remained constant in that love throughout the centuries of their dispersion...It is the longest, deepest love affair in history. Uris wrote "The Source", a history of Israel through finding artifacts in digs. What has happened to Jerusalem since 1947? The UN took up the Palestine question then and they recommended that all of Jerusalem be internationalized. The Vatican and other Catholic delegates wanted this, but the real reason for this decision was the Soviet Bloc's need to embarrass King Abdullah and his British patrons. It was this king who would take Judea and Samaria in 1948 illegally even though it was designated to become part of the Jewish National Home, passed by all in the League of Nations. The leaders to be of Israel, the Jewish Agency, then agreed in 1947 to this internationalization hoping to protect their dear city from conflict. The Arab states were against the idea as well as the partition plan itself. They wanted it all. Abdullah then invaded in 1948 and occupied east Jerusalem along with Judea and Samaria. Jordan's army drove out thousands of Jews whose families had lived in the city for centuries in exile. The UN's partition plan and internationalization went up in smoke. The Arabs had rejected UN Resolution 181. The UN established the UN conciliation Commission for Palestine on December 11, 1948 after Israel's birth on May 14, 1948. Prime Minister David Ben-Gurion said that Israel would no longer accept the internationalization of Jerusalem. The city was divided between Israel and Jordan from 1948 to 1967, when the Arabs lost their attack on Israel in the 67 War. During this period between 48 to 67, Israel had made its capital in the western part of Jerusalem while Jordan occupied the eastern section. There had been no peace pact yet with Jordan, so they were officially in a state of war, like all the other Arabs were. The city was divided with concrete walls and bunkers, barbed-wire fences, minefields and other fortifications that military people use. When the 1967 Arab attack started, Israel pleaded with Jordan not to be a part of the attack and to stay out of the war, but they didn't listen. Within about 2 days, the IDF drove out the Jordanians and after the war Israel moved to unite the city. Steven Schwebel, international legal scholar, wrote that because Israel was defending itself from aggression in the 1948 and the 1967 wars, it has a better claim to sovereignty over Jerusalem than that of its Arab neighbors. The land was all to be the Jewish National Home once again as it had been long ago. There has been no other people who have been picked on as much as the Jews. They have suffered from anti-Semitism since they were exiled in 70 CE by the Romans till today. Since Jews have been such an anathema to the world, the least it can do is back their right to inhabit their old homeland. The UN has been doing quite the opposite. In every which way they back the Arabs who would like to see Israel disappear and who have taken it upon themselves to finish Hitler's goal. Every country in the UN has a history of anti-Semitism, so it's like asking the fox to become a vegetarian. One nation only has stood up to the injustice against Israel, and that has been the USA. Back in biblical history, Joshua entered Canaan with the Israelites in 1320 BCE and defeated the Canaanite king of Jerusalem, Adoni-Zedek. The city was then an independent city between the tribes of Benjamin and Judah. In the 12th century, Jebus-Jerusalem maintained its independence with some Philistine help, until its was captured by David in about 1010 BCE and became the capital of a united Israel. This is documented in II Samuel 5: 6-8; and I Chronicles 11:4-6. King David was lenient with the Jebusites. He added the fortress of Zion and a House of Heroes for his guard. Then he built a tomb inside the city for himself and his dynasty. The Ark of the Covenant was transferred to Jerusalem and it became the religious center. His empire reached from the Red Sea to the Euphrates. King Solomon, his son, (970-930 BCE) added to the city with his commercial ventures and heavy taxes. He added the Palace and the Temple. It was then that Jerusalem truly became the religious capital. When Solomon died, the northern tribes seceded. Judah was created out of Israel who kept Jerusalem as their capital. The Davidic dynasty lived in Judah. All went well until it's destruction in 701 BCE by Sennacherib of the Assyrians. The city fell again in 586 BCE to Nebuchadnezzar of the Babylonians who deported most of the population and destroyed the temple and Royal Palace. Fifty years went by and most of the exiles returned and rebuilt the Temple in 519 BCE. Jerusalem then became the capital of a Persian province but was autonomous in internal matters under the rule of the high priest of the House of Zadok. All nobles and a 1/10th of the of the people were brought in to fill the half-empty city. Theocratic rule continued in Hellenistic times when the city was prosperous. The city was captured by the Parthians in 40 BCE and fell after a long siege to Herod in 37 BCE who was a Roman vassal who was the ruler. He built a palace in the NW quarter of the city with 3 giant towers. One is still there and is called the "Tower of David." He even rebuilt the Temple with a huge surrounding esplanade. This outer wall still stand and is called the Western Wall. It had been called the "Wailing Wall." Herod died in 4 BCE which caused the city to be ruled by a Roman Procurators except when Agrippa I reigned from 41 to 44 who built a 3rd wall to the North. When the procurator, Pontius Pilate was in charge, Jesus was crucified in Jerusalem in 29 CE. Roman rule was unbearable and the people revolted in 66. They were independent for 3 years when it was again besieged by the Romans under Titus and fell in 70 CE. The Temple and most of the buildings were destroyed. Bar Kochba revolted from 132 to 135 and Jerusalem was then liberated. The Roman emperor Hadrian had had it rebuilt as a Roman colony, Aelia Capitolina and forbade Jews to near it with a death decree if they did. Finally, the Roman Empire was Christianized and under Constantine, Jerusalem became a Holy City for their new religion. His mother, Helena, visited Jerusalem in 325 and had the Church of the Holy Sepulcher built in 335. Now it became a city of churches and monasteries, pilgrimages and religious disputes. In 363, Emperor Julian tried to restore the Temple unsuccessfully. In 614, it was occupied by the Persians who were assisted by a Jewish force, but by 628, Byzantine rule was restored by emperor Heraclius. In 638, the city fell to Caliph Omar who set up a place of prayer in the Temple esplanade, which was rebuilt in 691 as the Dome of the Rock by the Umayyad caliph Abed-el Malik. The Arabs allowed the Jews to return, but the city began to decay after they transferred the center of Abbasid rule to Baghdad in 750. The Fatimids in the 11th century built the 2nd mosque, El-Aksa, on the Temple site. Then in 1099 Jerusalem was invaded by the Crusaders led by Godfrey of Bouillon. They made Jerusalem a capital of the Latin Kingdom. Not for long, though, because by 1187 the Ayyubid sultan Saladin took the city for Islam again and it remained in Muslim hands. Under the Ottomans, it decayed and in the 18th and 19th century the population sank below 10,000 and part lay in ruins. The Jewish community was destroyed by the Crusaders and was almost non-existent in the 13th century, but not for long. The Spanish Inquisition of 1492 caused many Sephardim Jews to pour into Jerusalem when the government was restricting their entrance. In 1625 the local pasha Muhammad ibn Farukh killed many of them. A revival of population started in the 1880's when the first aliyah from Russia returned. By 1838 the population rose from 11,000 to 68,000 with 50,000 being Jewish. Who does Jerusalem like best? The Jewish people. Why? Because they take care of her. They love her. Nothing was done with Jerusalem when the Jews were forced out. It lost its special aura, its sheen, its speciality. It was just a city without the Jews.